Back in the early 70's life was simple back in Edmonds, WA. With a Bottle of Boones Farm wine, some spools of copper wire and some solder my friends and I (Robin Gudgel) would sit around and wire Phase Linear amplifiers for Bob Carver and Steve Johnston. Life was good and relatively stress free. Pay was not so good but we sure had fun. We took pride in building the world's most powerful stereo amplifiers. In 1973, Ken Cox and I left Phase to start another Hi-Fi company called Spectro Acoustics. Our first product was called the RobKen 2123. Ken was 21 and I was 23. We didn't make much money, but we learned just how hard it was to start and run a company. Phase Linear was eventually purchased by Pioneer and Steve Johnston began a life of sailing around the Caribbean in his new boat. 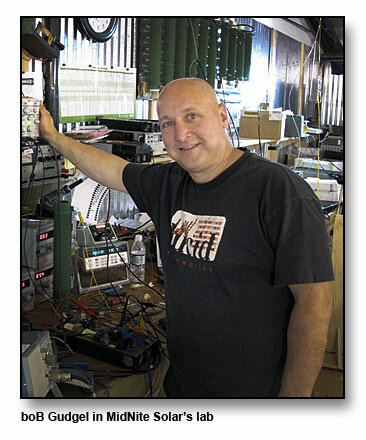 Living on a sailboat without electricity is not a lot of fun, so Steve used inverters made by Triplite. Back then things were not very sophisticated and the inverters would regularly fail. One day after throwing one more inverter overboard, Steve accidently met a bare foot hippie engineer, (Heart Ackerman) who was living on the beach in Costa Rica. Steve's boat just happened to pull up to Heart's beach. Heart also had been using the Triplite inverters and experienced similar reliability issues. I guess the strain of living in paradise got to them because they both came back to Washington State and started their own inverter company. Heart Interface was the first company to attempt to build a reliable inverter for off-grid and mobile/marine applications. Their own personal experience told them that there was a huge market just waiting for the right product. Steve had the mechanical engineering skills and Heart had the electrical engineering skills. Steve rounded up a few of the old Phase Linear employees to help build the Heart inverters in Kent WA. Ken Cox was out of the Hi-Fi business by then so he elected to join Steve. Clyde Yamamoto, an ex-Phase Linear electronics technician, was available as well as Greg Johnston, (Steve's brother). All of these guys had experience at electronics manufacturing. Things went very well at first, but as time went on, it was evident that the inverters were not living up to Steve's reliability standards. This issue led to a breakup of the Steve/Heart relationship. In 1984, Steve, along with Ken, Greg and Clyde left Heart and moved into a three story building at the Arlington airport. They asked another Phase employee, Mike Frost, to join a newly forming company. Mike was a very good technician and became the chief design engineer for this company, Trace Engineering. Their goal was to build an inverter that wouldn't break. Ken Cox (my old partner from Spectro) had the most experience at running a company, so he took the title of president. Everyone except Mike actually lived at the company up on the third floor. Forward to 1990: I spent eight years working in the military aircraft power supply industry designing nuclear cruise missile launcher power supplies for the B1-B and B2 bomber. In March, I received a call from Steve Johnston asking if I wanted to come join the old friends at Trace as the mechanical engineer. Steve also asked if I knew of an electrical engineer to bring with me. As a side project, I had been working on an 800 watt car amplifier with an industrial engineer that sat in the next cubicle. He wasn't a real electrical engineer, but he did impress me as a competent electrical designer. I asked him, Greg Thomas, if he would like to give up the life of building war machines to go help out the Trace boys. He agreed it might be fun. Trace needed new engineers because Mike Frost had decided to move on. The next eight years resulted in a new set of standards for the renewable energy industry. We hired Tim Economu in 1991 to design the DR inverter, so the team of Greg, Tim and Robin cranked out a dozen or so inverters during the 1990's. My brother Bob also joined the engineering team in 1994 to design some of these wonderful inverters and controllers. In addition to having worked in engineering for Bob Carver at Phase, Bob had been the main engineer at Spectro Acoustics too. The main inverter sales in the early days of Trace went to the marijuana growers in Northern California. A young entrepreneur, David Katz was the owner of our main distributor, AEE Solar. They helped to keep the doors open. Forward to 1998: The main owners of Trace decided it was time to sell the company. It was worth a lot of money at that time and a bird in the hand is worth two in the bush. I owned a small percentage of Trace so was able to put a sizeable amount of cash in the bank when the company sold. I also bought back into the new company based on promises of fame and fortune from the new owners. Engineers aren't known for making the best business decisions and this one turned out to be a real nightmare. Two years later the new owners of Trace merged with Xantrex in Canada. The management of the new merged company came from Xantrex. I was now part owner of Xantrex, one of the companies I had been trying to squash! Xantrex had done a fine job building small disposable high frequency inverters, but had virtually no presence in the off-grid market. Trace built their reputation on making reliable inverters that powered anything and everything the customer threw at it. Trace inverters had to work 24 hours a day, 7 days a week. The Xantrex inverter market was quite different and not nearly as demanding. The direction we were headed in Arlington changed with the new Xantrex management and I had numerous run-ins with them. In August of 2000 this all came to a head and "my position was eliminated". Great! They have a quarter million dollars of my retirement nest egg and I am out of a job. By the time I had made it back home from my lay off meeting, I decided to take what money was left in the bank and start a new inverter company. That day OutBack Power was conceived. I had enough money to entice the best of the engineers to join me at OutBack. A year after we started OutBack, I heard from my old friend Tim Economu. Tim wanted a full time job at OutBack instead of the contract engineering he had been doing since leaving Xantrex. Outback was not yet at the point where we were profitable, so I asked Tim if he could wait 6 months. If I had known that Tim's "plan B" was to hook up with Clyde that had just been fired from Xantrex, we would have found the money to hire Tim and Magnum Energy would not exist today! Turns out ok though since my wife's son Jason is one of the founding members of Magnum. Jason Rintoul also worked with us at Trace since 1990 and was fired about the same time as Clyde. Magnum Energy is doing very well these days and Jason drives a 550HP Cadillac. From 2000 to 2005 OutBack grew and prospered. We had a great team who developed some of the most innovative RE electronics ever seen. One of the best products was the MX60 designed by my brother Bob. Unfortunately with success also comes change. After five years, things just weren't fun anymore, partners can be a real pain, so my wife Mary, Bob and I left Outback. I tried gardening for a short time, but I am just not cut out to be a gardener. A few months later once again we decided to start a new company. Bob and I still have too many good ideas to be digging up weeds. My focus with MidNite Solar is simplicity and reliability, we know off grid living presents a lot of challenges. Figuring out how to wire up your system should not be one of them. MidNite has greatly simplified the assembly and wiring of a battery based RE system. We manufacture E-Panels that work with OutBack, Magnum Energy, Xantrex, Apollo, Samlex, SMA and soon Morningstar inverters. By the way, MidNite still uses the same small sheet metal shop we used way back in our Hi-Fi days of 1971. We've grown old together. Just to round out the story of the Northwest inverter companies, I recently ran into Heart Ackerman at a solar show in San Diego. Heart has been working on an inverter design down in Costa Rica and asked me if I would design the battery terminals for his new inverter. Midnite works with most of the inverter manufactures to provide cost effective balance of systems components and engineering. 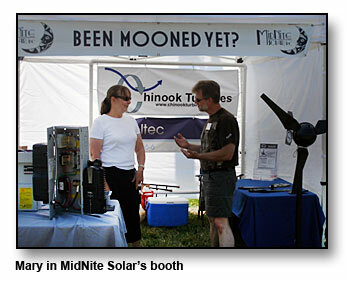 MidNite Solar has 11 full time engineers, so stay tuned for more innovative products in the future. Update 8/13/09: It looks like Mary and I are needed to help out our old company OutBack. We still own 24% of OutBack and will be on the board of directors. This will be interesting since MidNite directly competes with OutBack on some items and more coming right around the corner. Update 2010: We got OutBack back on the right track with new management and then sold it to Alpha Technologies. They have elected to move a lot of the manufacturing to India so MidNite has been hiring laid off OutBack employees.